Who doesn’t love Old school hack and slash fun, combined with loots? Ahh, nostalgia! As a die hard fan of Diablo 2, and the like , I was delighted when the developers of Diablo released a highly polished game, Torchlight. It isn’t a clone, but the gameplay and elements are very similar to D2. 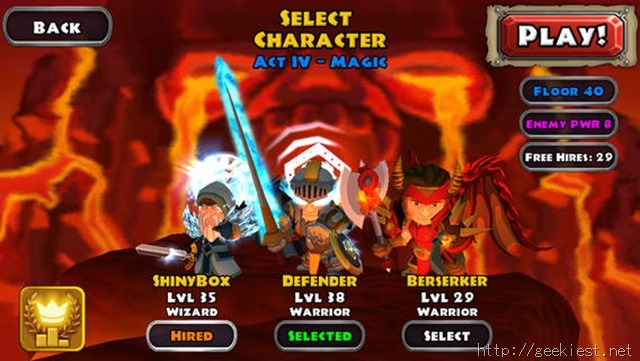 Now coming back to our article, Dungeon Quest, is basically a replica of Torchlight. The game is worth playing in quick short sessions, however it does come with serious flaws. I have played the Android game and have been following its progress for quite while. While the IAPs are not necessary, sometimes they are quite annoying. Especially the fact that you get just one character slot for Free, and have to spend real money to buy additional character slots. And you have to spend money to get all those shiny looking decorations, and powerful pets. Any IAP will get rid of the ads, so if you want to buy an IAP, get the additional character slot. It is quite ironical that the title contains the word “quest” when the game doesn’t even have a story. And the bosses in the game are literally the combat clones of Andariel, Mephisto, Duriel and Diablo. The first boss attacks with Poison, the second with Lightning, the third with Ice, and the fourth one with fire. Basically what the Diablo 2 bosses do, minus the thrill of strategical combat. The Combat is too easy, basically all you have to do is keep punching the attack button while dodging the enemies, given the right equipment you will never run out of mana. Sometimes it gets so easy, you feel like there is no real challenge, of course you could just crank up the difficulty levels a bit, but then again you might come to a point where you find enemies aren’t even scratching you. And there is no multiplayer support either. Dungeon Quest is a perfect example of how a game with potential has been ruined by IAPs, and lack of quests. Give it a price tag and a proper story, and it might actually be worth playing. If you have an itch to play Diablo and are away from your PC, you can download Dungeon Quest for free.